2 pairs of shoes; Hiking boots and camp shoes. Your boots will be used for portaging and canoeing. As for camp shoes choose what you like but make sure they are durable. Also great are canoe/water shoes which are basically heavy duty sandals with boot treads; Keen makes a large selection. At least 3 or 4 pairs of socks. Hiking socks are preferable. Make sure one pair is heavy for sleeping in cold weather. Also have a lighter pair for warm weather and in camp. Also consider looking into dry socks that, when your boots get wet, will keep your feet dry. Cotton socks should not be worn when using Kevlar canoes – the canoe is made from lightweight material and needs to be floating in the water before you load and unload it, making it necessary to stand in the water. Clothing; Two sets of clothes including, pants, underwear, base layers, flannel shirt, wool sweater, t-shirt. Layering is important. Attempt to avoid cotton. Always have a second change of clothes in case your initial set gets wet. Keep an extra set of clothes in your car for the trip home. Clothing is a personal preference, but make sure you are always properly prepared for the elements as the Arrowhead weather can change in a heartbeat. Warm jacket if going into cold weather. GPS – we have a Garmin inReach SE for rent. Cell phone GPS will work but you need to download a map before you leave WiFi. Cell phones cannot send or receive messages in our area, but a satellite device like our inReach can, plus they include an emergency beacon that could summon the County Sheriff or a float plane for rescue. Fire starters; stormproof matches, flint & steel, lighters that ignite in the wind. Fishing Lures; Dependent on what you plan to fish for. 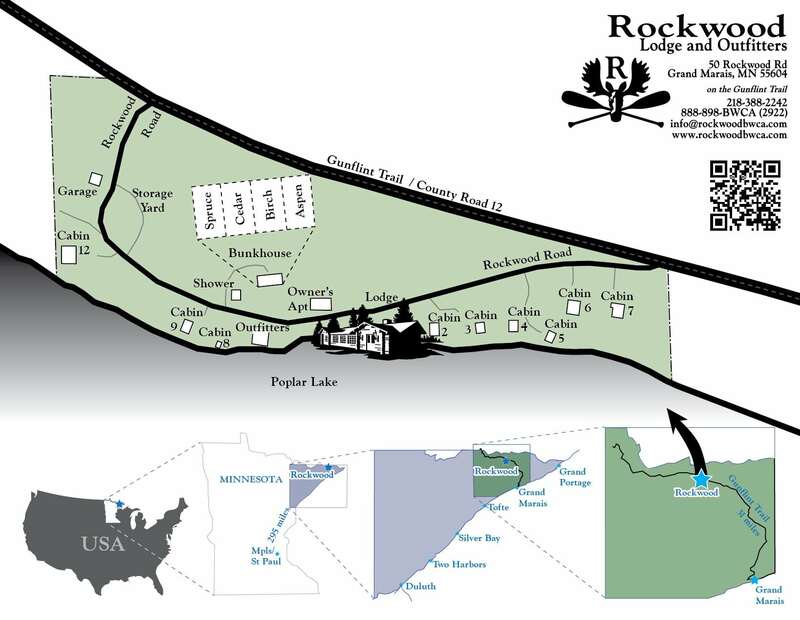 If needed consult Rockwood Lodge and Outfitters for recommendations, and to see what we have in stock. Here at Rockwood we can outfit your BWCAW adventure. Here is a list of the equipment that we can supply. Tarps; preferably one large enough to cover your camp grate area for your group to sit rain free + a small emergency back-up. We do have some used fishing rods and reels for you to use, conditions vary. Remember to pack as light as possible because you will have to carry it. Leave a set of clean clothes in your vehicle for the end of the trip. Change into them after taking a hot shower here at Rockwood. Stay warm and stay dry!